Last month’s article addressed the refurbishment of the windshield wiper mechanism and installation of stainless steel heater pipes. 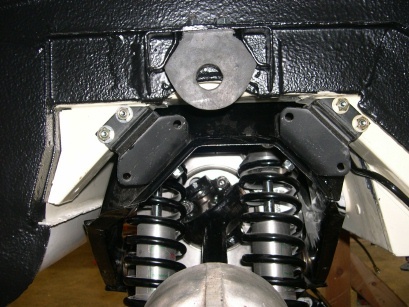 This month we will look at the installation of the independent rear suspension (IRS) unit. The E-Type IRS represented a major technological advantage when it was introduced on the original car. 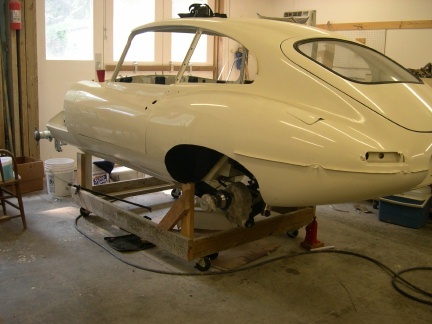 Although Jaguar was certainly not the first car manufacturer to use an IRS, its introduction on the E-Type was a significant upgrade to the live rear axle used on its predecessor, the XK-150. In a nutshell, the IRS allows the rear tires to remain more firmly planted on the road surface during cornering, even over rough or uneven surfaces. The Jaguar IRS also incorporates a limited slip unit in the differential, which ensures delivery of traction to the road, and in-board brakes, which reduces un-sprung mass out at the wheels. All of these features add to the E-Type’s credentials as a performance oriented sports car. As I have discussed in a previous article, the entire IRS unit was removed from the car and completely refurbished. The limited slip differential was re-built by Coventry West in Lithonia, GA. I blasted and painted all of the parts and installed new bearings and U-joints. New splined hubs were sourced from Welsh Jaguar, as the original splines were pretty well shot. Upgraded coilover shocks were purchased from Classic Jaguar. As I said before, the completed IRS unit with all its shiny bits represents a major milestone in the completion of the car and is a definite photo op. But you aren’t done until you get it installed into the car and that turned out to be quite a job. First, you want to examine the area under the car where the IRS will go and make sure all the painting is done, as this is the last time you will easily get in there. While things were wide open, I decided to apply of coat of POR-15’s truck bed liner product to the wheelwells. I discovered too late that a traditional “body shutz” product has to be applied under the urethane paint. But the truck bed liner, which has a similar tough, pebble like texture, can be applied over the urethane paint, after it is suitably roughened up. After careful masking of the surrounding surfaces, I used the applicator supplied with the POR-15 kit to apply the product. Another item that you absolutely must not overlook is the fuel line that runs over the IRS unit from the bulkhead fitting near the electric fuel pump to a location just under the floor boards. There is no way you could install this fuel line with the IRS in place. My existing line was in pretty good shape to so I blasted and painted it and did the install. As you know, I never miss an opportunity to buy a new tool! In the case of the IRS installation, you really must consider the purchase of a transmission jack. This was really a “no-brainer” as a simple transmission jack can be had from Harbor Freight for less than $100. This is basically a scissors jack with a rectangular platform on top and 4 wheels. Once you set the IRS (or transmission) on top of it, you can crank it straight up in a safe manner. A floor jack on the other hand has a miniscule platform and tends to move horizontally as well as vertically when lifted. The job can probably be done with a floor jack but as we will see, the additional aggravation might not be worth it. Of course, the rear of the car must be suitably elevated. In my case, the car is elevated substantially on its rolling support frame so that factor was already taken care of. I suppose that having the car up on multiple jack stands would also work. One fear that I had was that without the engine installed, the car might just perform a “wheelie” when I got the weight of the IRS in place. As we will see, fortunately that didn’t happen. Months ago, before I had completed the IRS assembly, I had attempted a test fit of the raw IRS “cage” without any components installed. The cage attaches to the body via 4 rubber mounting blocks. Each block has bolts that attach to the body and to the cage. At that time, I couldn’t get everything to line up. I thought it must be poorly manufactured mounting blocks so I pulled the original mounting blocks out of the scrap pile (never throw any old parts away!) and tried those. They wouldn’t fit up either. Strange! I could only assume that the rubber blocks must require some coercion to get them lined up so I gave up further attempts at that time. I researched the issue using the archive/search function of Jag-Lovers and found that indeed others had the experienced the same issue. So with everything ready, I used my overhead shop “come-a-long” to lift the IRS onto the transmission jack and then rolled the jack and IRS under the car. The jack uses a 1/2″ socket drive for its motive power during ascension. I used my air powered impact wrench to drive the jack and the IRS moved smoothly vertically. As it neared its required position, I slowed down and carefully approached the target. There are 4 mounting brackets and twice as many holes to line up. I chose to loosely mount the brackets on the IRS cage and line them up with the car. The front 2 brackets lined up well so I inserted their bolts. But now the 2 rear brackets didn’t appear to be remotely in alignment. The mounting points are on a 45 degree slope so I figured that more weight would help. Sure enough, as I got the full weight of the car applied to the mounting brackets, the holes shifted into better, if not perfect alignment. I used a tapered chisel as a “drift” to bring one set of holes into perfect alignment, albeit forced. This allowed me to “make” the adjacent bolts into their holes. When I removed the drift, the holes remained close enough that I was able to make the second set of bolts. Whew, that wasn’t too bad! So I set to placing nuts and lock washers on the ends of the bolts. Bad news! I couldn’t access all of the bolts to start the nuts. After some study, I realized that I would have to change my assembly sequence and install some of the nuts prior to installation of the IRS. Bummer! Out came the recently installed IRS. The next time, the installation process using the drift and the jack went a little better and, with the correct bolts pre-installed, I was able to get the remaining nuts and washers installed and tightened. As I mentioned previously, I gingerly lowered the jack, prepared to stop immediately if the front of the car tried to rear upward. Fortunately, everything stayed stable. Some additional tasks remained. Installation of the sway bar was uneventful. 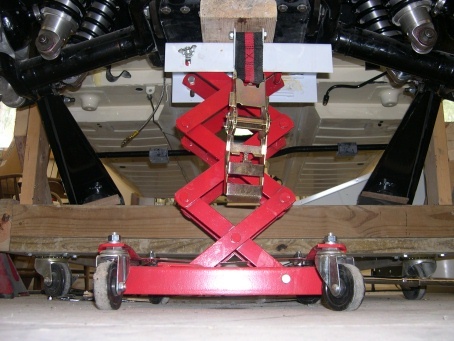 The connection of the trailing arms to their mounting points forward under the car proved to be a challenge that was only resolved by application of some force with my come-a-long to shift everything into correct alignment. So there it was. A beautiful sight with the IRS installed! With 4 splined hubs at the 4 corners of the car, I could technically fit up 4 tires and wheels and lower it to the ground. It was tempting but not yet. I still wanted the car at the decent vertical position to make the installation of the wiring and upholstery an easier prospect.